This week is a very special edition of the show. My guest is Andrew Greene, director of the Peacherine Ragtime Society Orchestra. We will be talking about, and playing music by, early 1900s composer Mel B. Kaufman. Even if the name isn't familiar, I can almost guarantee that you've heard Mel's music. 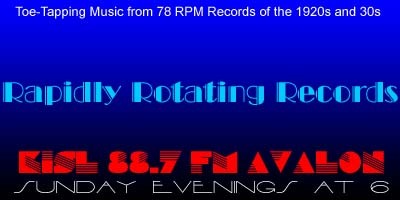 Listen for some very interesting information and some great music. Just click on the link below to instantly listen streaming online and/or download the show. Your comments, requests and suggestions for topic suggestions are always welcome. Enjoy! Here are the sheet music covers for some of the Mel Kaufman tunes we'll be playing on the show this evening.